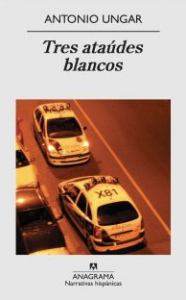 Publisher Anagrama announced this week that the 2010 winner of the house’s prestigious Herralde Novel Prize (worth €18,000) is Colombian writer Antonio Ungar for his novel Tres ataúdes blancos, or Three White Coffins. The novel is set in the fictional Latin American country of Miranda, where by mistake the protagonist is installed as leader of the political opposition. Ungar, who is married to a Palestinian and now lives in Jaffa, describes the book as a black-humored farce, and notes that he didn’t have to look far for good material: “The reality is so abundant that I haven’t had to make anything up, I’ve drawn from day-to-day events; in Colombia or Peru things happen that as literary material might seem excessive.” Tres ataúdes blancos is published in Spain by Anagrama; Ungar won the Prix Courrier International for best foreign novel for his previous book Las orejas del lobo, or The Wolf’s Ears, and has had stories translated into five languages, but he doesn’t appear to have an English-language publisher…yet.